It’s a new day in American foreign policy. 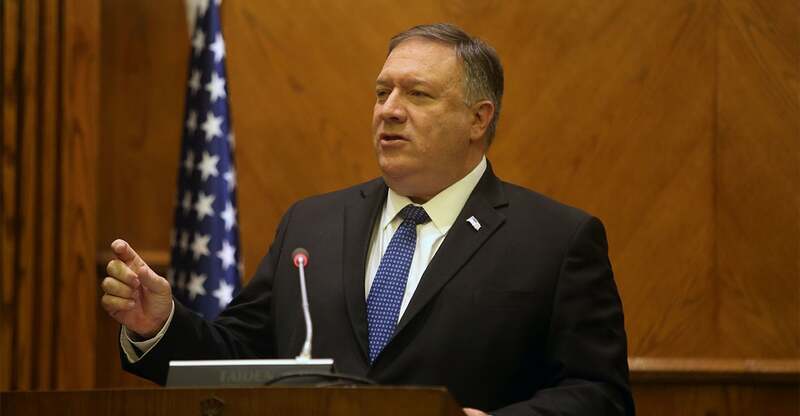 On Thursday, Secretary of State Mike Pompeo delivered a forceful speech in Cairo, Egypt, in which he stated that the Trump administration had learned from the mistakes of the Obama administration and has reasserted the traditional U.S. role as a “force for good” in the Middle East and a reliable ally for Arab states threatened by Iran or Islamist terrorists. It was here, here in this city, that another American stood before you. He told you that radical Islamist terrorism does not stem from an ideology. He told you that 9/11 led by country to abandon its ideals, particularly in the Middle East. He told you that the United States and the Muslim world needed, quote, ‘a new beginning,’ end of quote. Pompeo thanked Egyptian President Abdel-Fattah el-Sissi for promoting religious freedom and denouncing the “twisted ideology” of Islamist extremism. He called on other regional allies to boost their own efforts to defeat Islamist extremism. Pompeo also focused on the regional threat posed by Iran and its Shia militia surrogates in Iraq, Lebanon, Syria, and Yemen. To roll back Iran’s influence, Pompeo promoted the establishment of a Middle East Strategic Alliance that would coordinate the efforts of the U.S., Egypt, Jordan, and the six countries of the Gulf Cooperation Council: Bahrain, Kuwait, Oman, Qatar, Saudi Arabia, and the United Arab Emirates. After the speech, Pompeo announced that the United States would convene an international summit conference in Poland on Feb. 13 that would focus on pushing back against Iran’s hostile policies. Pompeo is likely to expand upon these initiatives for building a stronger anti-Iran coalition during the remaining stops of his Middle East tour in Bahrain, the United Arab Emirates, Qatar, Saudi Arabia, Oman, and Kuwait. The U.S. effort to establish a Middle East Strategic Alliance, a NATO-style collective security organization, is likely to be an uphill struggle. Many Arab leaders distrust each other and are divided by regional rivalries. A major problem is likely to be persistent tensions between Qatar and other Arab states due to Qatar’s support for the Muslim Brotherhood and its perceived closeness to Iran. Since 2017, Qatar has been sanctioned and blockaded by Saudi Arabia, the United Arab Emirates, Bahrain, and Egypt, who also broke diplomatic ties with Qatar. Earlier this week, Anthony Zinni, a retired general serving as the Trump administration’s special envoy for resolving the Qatar dispute, resigned due to the unwillingness of regional leaders to accept his mediation effort. Zinni’s resignation is a sign that the Trump administration’s efforts to organize an “Arab NATO” are unlikely to succeed anytime soon. Although Iran poses a major threat to the region, inter-Arab rivalries remain a formidable stumbling block.